Wordless Wednesday – Got books? 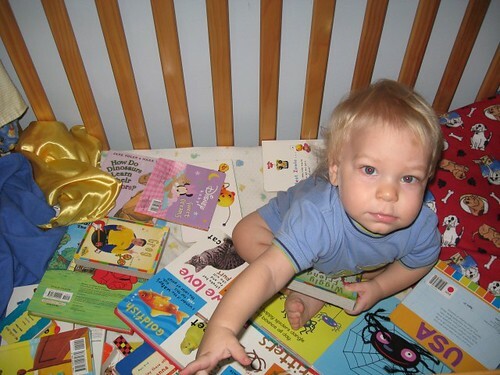 FYI – The crib library was thanks to big brother. Mommy asked him to give the little guy a book since he was asking for one after waking up from a nap. I guess next time I will mention a specific quantity! At least he had choices! Looks like some good reading there! Okay, that is ADORABLE!!! Start the love of books early! He’s beautiful. By the way, thank you for your comment on my blog about SPD. I never know if I’m explaining it clearly or not. Books and babies..those are some precious pictures. 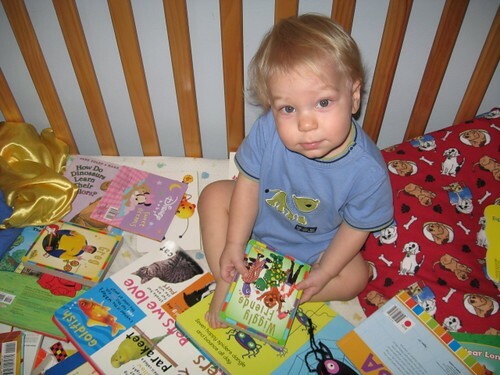 That’s quite a library for such a cute little man ! A future librarian? One can never have too many books. Such a cute little guy. Gotta love his joy in Mreading! That’s too cute!! What a sweet brother to make sure he had plenty of reading materials too!! Love it! LOL! You can never have too many books! More the merrier of course! Cute pictures. He looks happy with his plethora of books. Adorable! I love these photos! His face is priceless! How did he ever choose??? Cute pictures! My kids do the same thing, you ask for one and they bring you twenty! That’s funny. One can never have enough books in bed. Wow! He sure is doing a lot of studying! How cute!!! I love WW `cuz it makes me so much more aware of snapping pics on the fly. Grabbing the camera and taking silly pics. Like this morning, there was a GIGANIC spider in a web outside in a web. I ran inside to grab the camera and get a shot of it! Blessings! And thanks for visiting!!!! I love that look like, “Mom, get that camera out of my face, I am reading here!” Adorable. Well, that should have kept him busy for awhile. Too cute! Happy WW!!! he he he that is one big library! Too cute!! I figured big brother might have something to do with that. I’ve seen similar things here! Thanks for stopping by to see my baby’s bunny feet. 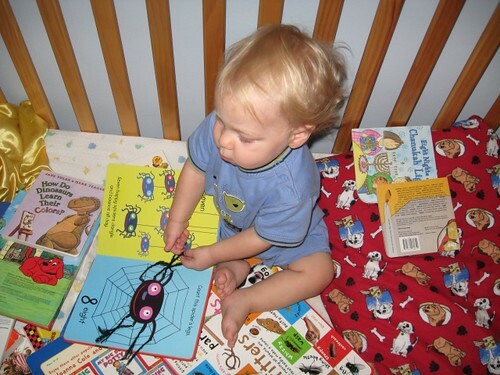 I love your pics – my kids always had to have books, toys, stuffed animals in their crib. There was barely enough room for them to sleep. Thanks for visiting my WW. Oh what a cute little guy! My prayers for your little one, too. God bless your family.